The 8-game conference winning streak is the longest by a K-State team in the Big 12 era and the longest regular-season conference winning streak in 45 seasons since the Wildcats won 11 consecutive conference games from Jan. 14 to Feb. 26, 1974 in the old Big Eight Conference. Down 48-41 with 9:50 remaining, K-State (18-5, 8-2 Big 12) ended the game on a 29-15 run, including a pivotal 21-5 spurt ignited by a 3-pointer from sophomore Cartier Diarra, to earn its fifth consecutive win over Baylor (15-8, 6-4 Big 12), including its third in a row at the Ferrell Center. The Wildcats, which shot just 40.4 percent (23-of-57) from the field, did most of their offensive damage from 3-point range, knocking down 6 of 9 triples in the second half, including 3 in the last 6:11 of the contest. The team has now connected on 35 3-point field goals in the last 3 games on 44.3 percent shooting (35-of-79). Stokes was among four players to score in double figures, as he and fellow seniors Barry Brown, Jr. (13) and Dean Wade (12) combined to score 45 of the Wildcats’ 70 points. Stokes went 5-of-10 from the field, including 3-of-6 from 3-point range, and a perfect 7-of-7 from free throw line in 36 minutes. It marked his ninth career 20-point game, including his second this season. Brown, who has now scored in double figures in 10 consecutive games, became the school’s all-time leader in consecutive games played (128) with his 106th straight start, breaking his tie with Steve Henson (127, 1987-90). He finished with 13 points on 4-of-8 from the field, including 3-of-7 from 3-point range, to go with a game-high 6 assist and 3 rebounds. Wade, who has now scored in double figures in 7 straight games, chipped in 12 points on 4-of-10 field goals and 4-of-4 free throws to go with a team-tying 7 rebounds. Diarra, who scored all 10 of his points during the pivotal 29-15 run to end the game, enjoyed a solid all-around game with 4 assists, 2 blocks and 2 assists in 29 minutes off the bench. K-State is now 8-1 this season when four or more players score in double figures. Baylor, which played without senior starters Makai Mason and King McClure due to injuries, were led by junior Devonte Bandoo’s 15 points, while junior Freddie Gillespie and freshman Jared Butler added 13 points each. The teams went back and forth in the early going with K-State taking a 10-6 lead on back-to-back 3-pointers from senior Barry Brown, Jr., and junior Xavier Sneed. However, the Bears answered with an 11-2 run, which including 3-pointers on 3 consecutive possessions to take a 17-12 into the second media timeout at the 11:52 mark. The Wildcats closed to within 17-16 on jumpers by Sneed and junior Makol Mawien, but junior Devonte Bandoo connected on consecutive baskets to push the Bears’ lead out to 21-16 with 7:56 before halftime. A 5-0 run, ignited by a 3-pointer by senior Kamau Stokes, knotted the game at 21-all at the 6:24 mark. The two teams traded baskets over the next few minutes to sit at 25-all at the final media timeout with 2:52 remaining. Back-to-back dunks by Baylor forced head coach Bruce Weber to call his first timeout with 2 minutes to play before halftime and the Bears leading 29-25. However, the Wildcats finished the half on a 6-0 run, including consecutive baskets by Mawien, to take a 31-29 lead into the break. K-State connected on 41.9 percent (13-of-31) in the first half, including just 21.4 percent (3-of-14) from 3-point range, while Baylor hit on 48.1 percent (13-of-27), including 27.3 percent (3-of-11) from long range. Sneed was one of five Wildcats with field goals in the opening half, as he led the way with 9 points, while junior Freddie Gillespie paced all scorers with 10 points for the Bears. A Wade jumper gave K-State a 33-30 lead just minutes into the second half, but Baylor answered with a 6-0 run to take a 36-33 advantage at the first media timeout with 15:28 remaining. A 3-pointer by Brown tied the game at 36-36 all, but the Bears responded with 9 of the next 13 points, including a corner 3 by freshman Jared Butler, to take a 45-40 advantage with 11:34 to play. Baylor extended the lead to 48-41 with 9:50 remaining before an 8-3 spurt by K-State closed the gap to 51-49 at the media timeout at the 7:38 mark. Back-to-back baskets, including a 3-pointer, by sophomore Cartier Diarra gave the Wildcats their first lead in more than 11 minutes at 54-53 with 6:09 to play. The Diarra triple ignited a 21-5 run over the next 6:16 of the contest that gave K-State a 62-53 lead with 3:20 to play. The Bears closed the deficit to 64-61 with 35 seconds remaining on the strength of 3-pointers from juniors Mario Kegler and Devonte Bandoo and two free throws from Bandoo. However, the Wildcats closed it out from the free throw line, as Stokes and Diarra combined to go a perfect 6-of-6 from the line. K-State finished 40.4 percent (23-of-57) from the field, including 38.5 percent (10-of-26) in the second half, while Baylor shot 44.6 percent (25-of-56), including 41.4 percent (12-of-29) after halftime. The Wildcats were able to capitalize on Bear mistakes, scoring 19 points off 13 turnovers. Stokes scored 13 of his 20 points after halftime, while Brown and Diarra each added 10. The trio combined to score 33 of the Wildcats’ 39 second-half points. Kamau Stokes – Senior Kamau Stokes scored a game-high 20 points (13 in the second half) on 5-of-10 field goals, including 3-of-6 from 3-point range, and a perfect 7-of-7 effort from the free throw line. It marked his ninth career 20-point game, including his second this season. 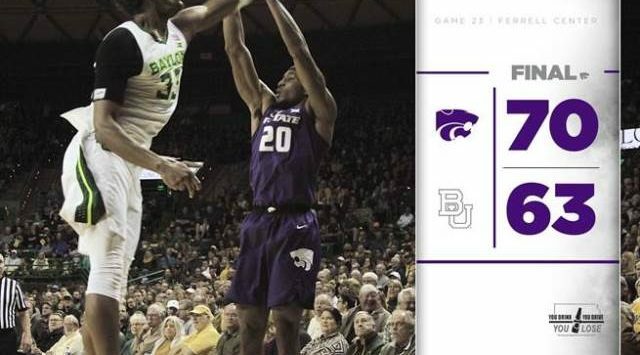 29-15 – K-State used a 29-15 run over the last 9:36 of the game to post its fifth consecutive win over Baylor, including it third in a row at the Ferrell Center. The run was ignited by a 3-pointer by sophomore Cartier Diarra, who scored all 10 of his points during the pivotal run.